The typical entrepreneurial image looks somewhat different. 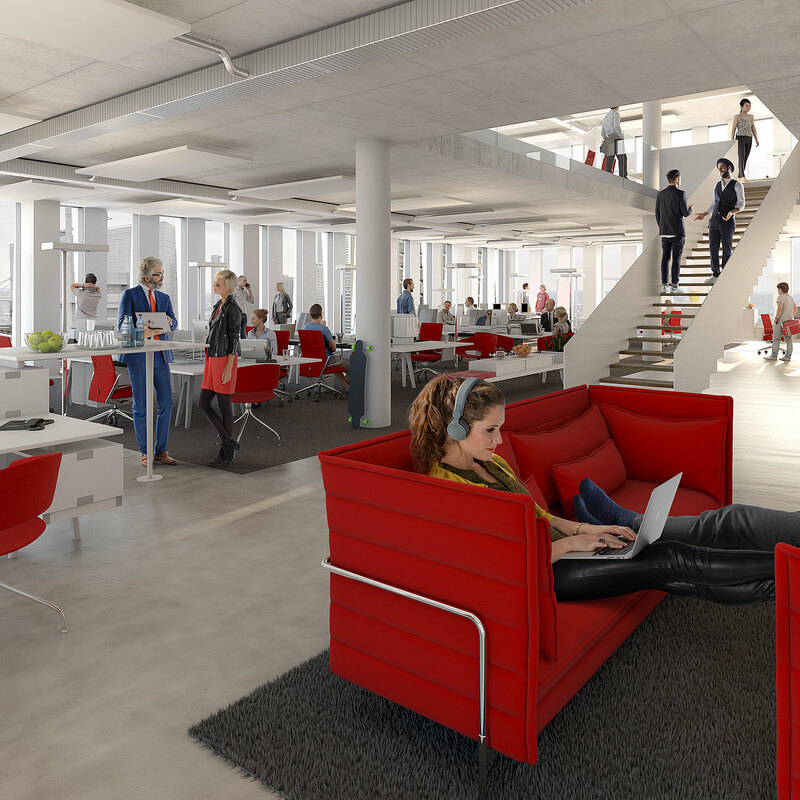 The list of tenants displayed in the Berlin coworking centre Rent 24 tends more towards the likes of Amazon, Accenture and Tesla than hip start-ups. And it doesn’t look much different at WeWork und Co. What are the reasons for it, are expectations being fulfilled and are there also alternatives, perhaps ones that are even better? First marvelled at as a trendy fringe phenomenon, the property market today would be inconceivable without coworking spaces. According to surveys by Colliers, in the most important German business districts, this segment has achieved a market share of more than five percent in the past year. That equates to around 200,000 m2 of office space. The brokerage firm asked the tenants of coworking centres what their main reasons were for renting the spaces. A very important reason was the reduction of fixed costs during fluctuating space requirements, e.g. during certain project phases. The lack of availability of space, particularly in the sought-after top 7 locations, also played an important role. The original community thinking behind coworking still remains important, but it is no longer the driving force. 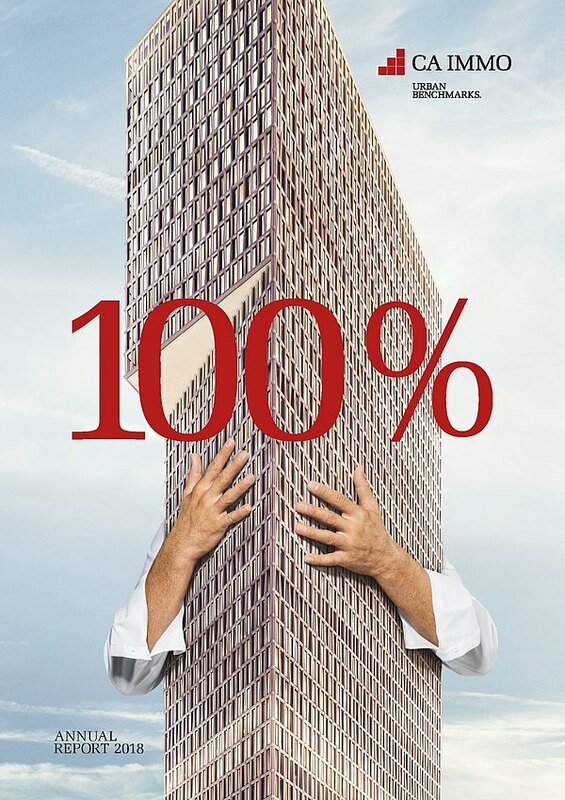 Frankfurt`s ONE offers a wide range of workplaces. The questionnaire only focuses on the pure renting of time-limited office work spaces and does not include the model of “incubators”, that is, a company’s own think tanks. The thought behind it is for a company to offer an area under its own brand that is open to employees as well as external service providers, freelancers or startups - later cooperation is not excluded. Does coworking keeps its promises? But does coworking also increase contentedness amongst employees, loyalty to the company, exchange of ideas with third parties, capacity for innovation and finally the productivity of employees and companies? 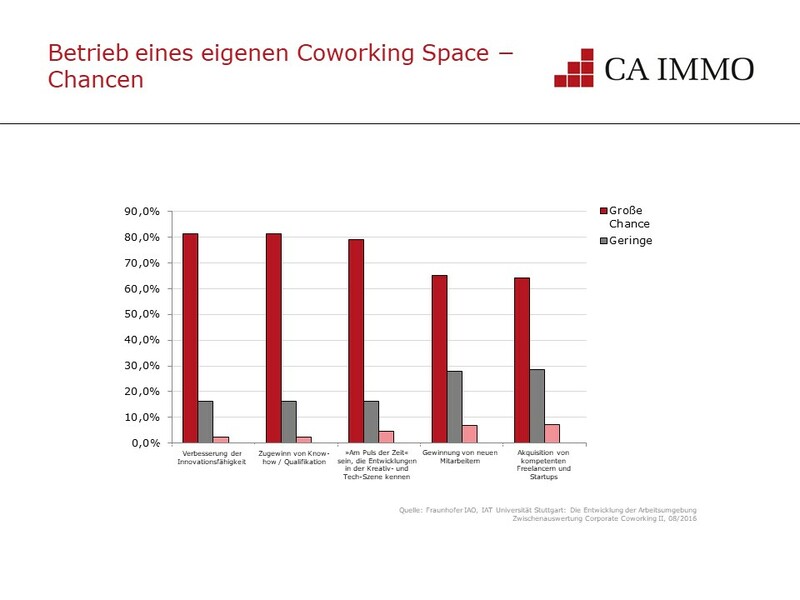 In its study “Coworking – Driver of Innovation for Companies”, the Stuttgart-based Fraunhofer Institute for Industrial Engineering therefore posed the question as to whether corporate coworking is an effective driver for innovation within companies. In any case, around 80 percent of the companies questioned in the study can imagine that they might rent coworking spaces themselves and use these largely as temporary team and project spaces. The reasons are wide-ranging: Improving employee motivation, increasing capacity for innovation, increasing the attractiveness of the company and keeping a “finger on the pulse of the times”. Many companies see coworking as an opportunity. 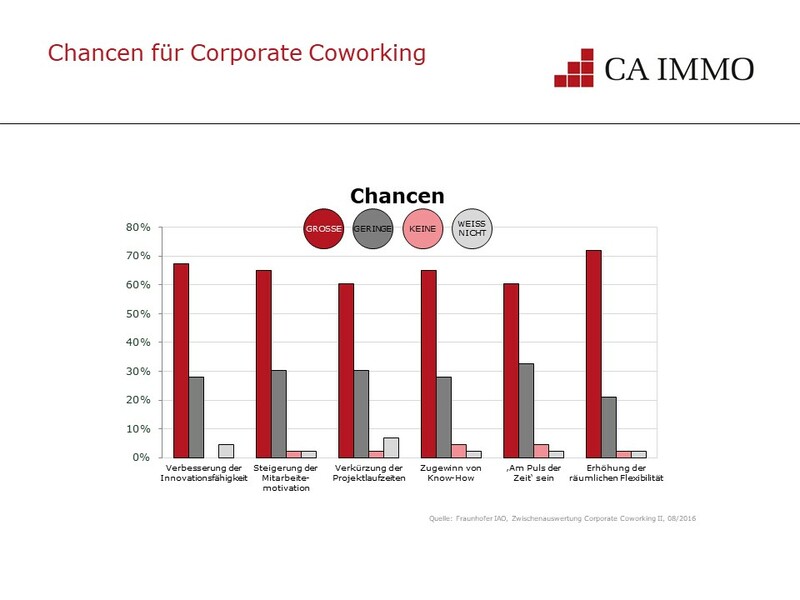 However, it’s interesting that many corporates view their experience with coworking spaces somewhat more soberly, since exchanges with third parties tend to occur by chance, and the loss of loyalty towards the company from its employees is also perceived as posing a risk. It’s therefore no surprise that more and more companies, even those operating in more classic sectors, are setting up their own coworking and campus structures which, on the one hand, purposely seek out coworkers who are active in similar areas and, on the other hand, provide employees with a wide range of offers. Examples of this are companies such as Bosch, Daimler, the Otto Group or even Erste Bank in Vienna. But are these options only for corporates, or rather, how can smaller companies or company sites utilise similar solutions? 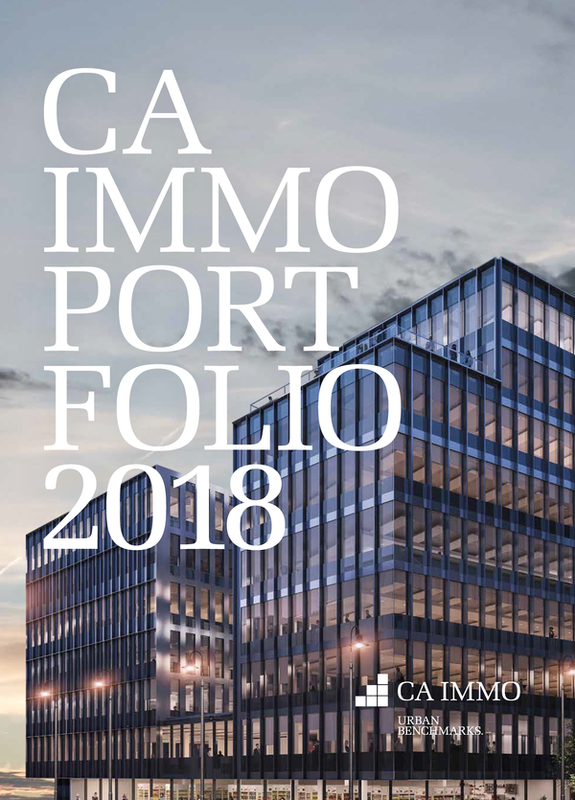 With ONE in Frankfurt, CA Immo has its own approach to this. 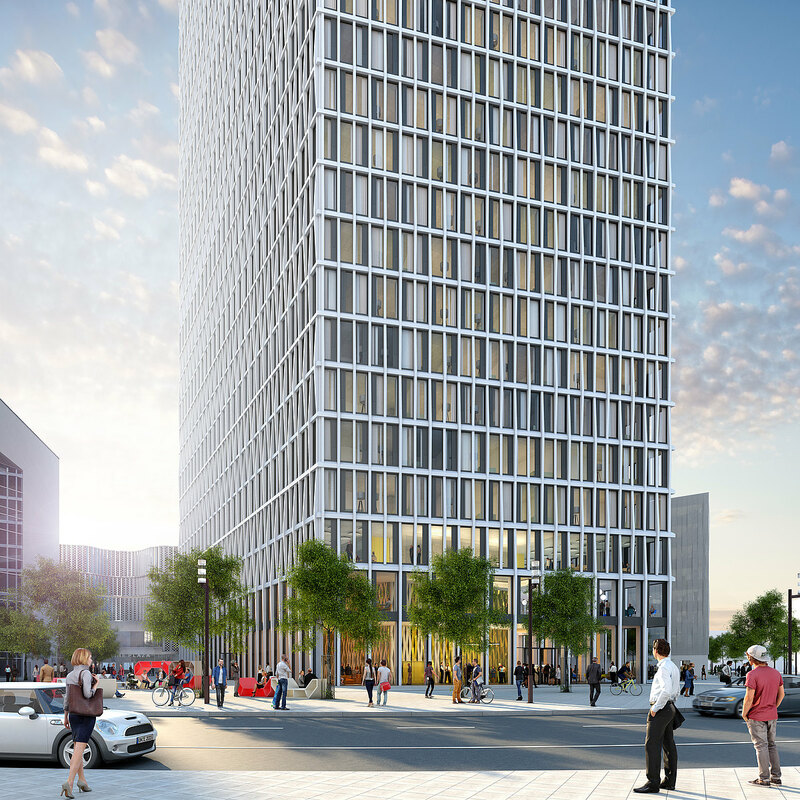 The 190-metre-high office and hotel high-rise, which is currently being created at a site located between the banking district and the trade fair, purposefully combines various uses under one roof. The choice of uses, however, was no accident based on rental requests, but was conceptually thought out according to the requirements of the future tenants. The city does not end at the facade of ONE. For example, there will indeed be a coworking area that will be available for these tenants, firstly to be rented as additional space on a flexible basis in the same building, but also to bring together temporary project teams or to offer employees an alternative “cool” workspace. 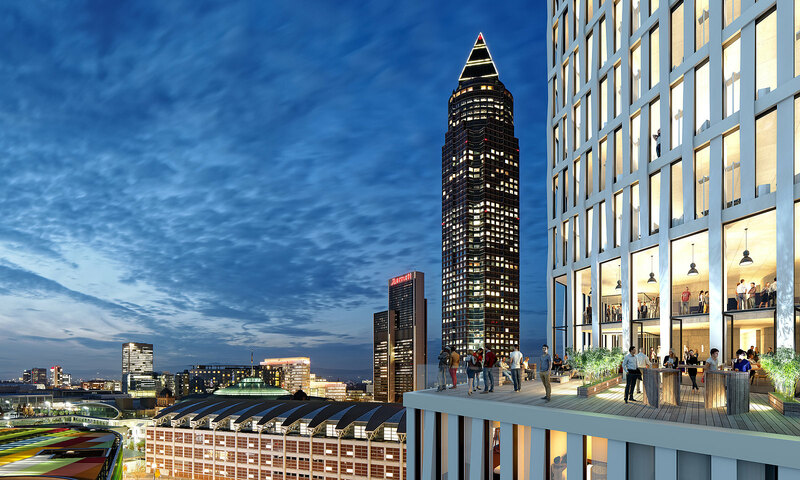 The building also houses a public café, a restaurant, a lounge, a cocktail bar and Frankfurt’s only Skybar, with breathtaking views. ONE will therefore become a part of the city. The city does not end, as is usually the case, at the façade, but continues inside the building. 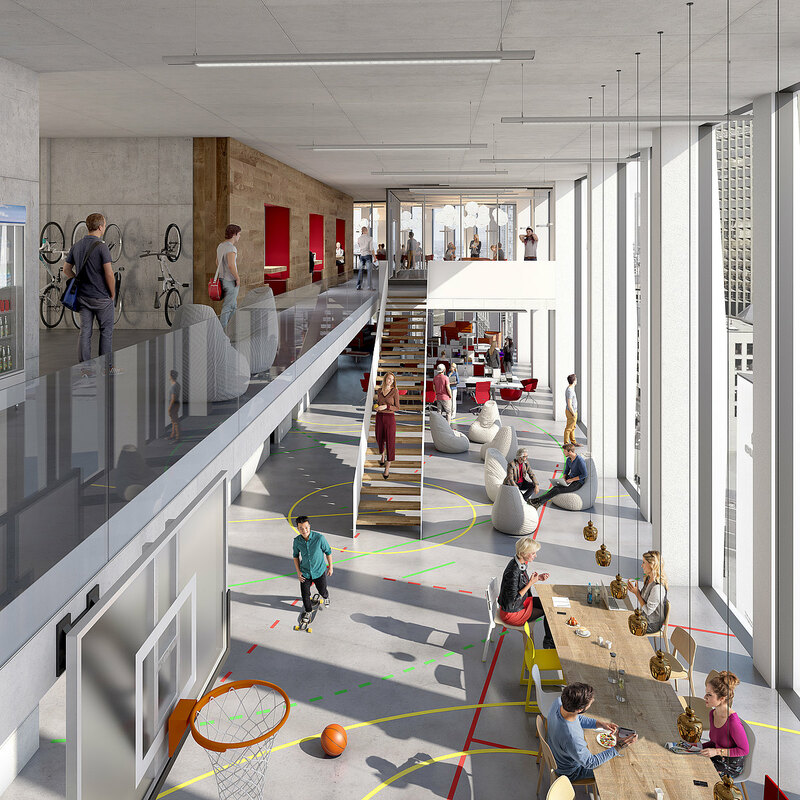 ONE is a vertical campus, a cool location where people want to be. This allows companies to benefit not only from additional services such as the hotel-operated conference area but also from the location itself which will become a strong argument in the “war of talents”.